Not much happened during the first week of April 2019 to shift the S&P 500 off of the upward trajectory it has tracked since bottoming in December 2018. Moreover, over the last 10 weeks, it has largely fallen within the range of the red zone we added to our spaghetti forecast chart 10 weeks ago. Fortunately, the echo of past volatility in stock prices is starting to fade, where we only need to continue displaying the redzone forecast for just another two weeks. 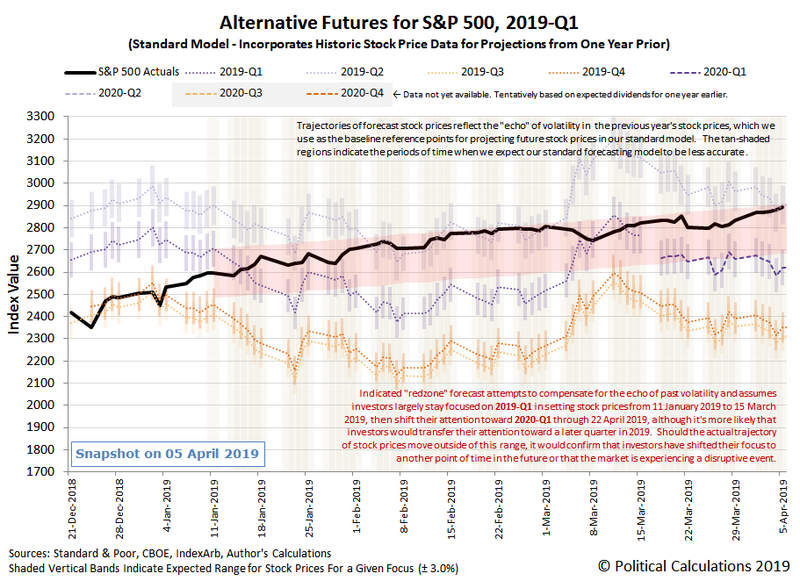 Not much happened during the first week of April 2019 to shift the S&P 500 (Index: SPX) off of the upward trajectory it has tracked since bottoming in December 2018. That's not as impressive a forecasting achievement as it might seem however, since we've been experimenting with automatically updating the trajectory of our redzone range as expectations for the future have changed over that time. 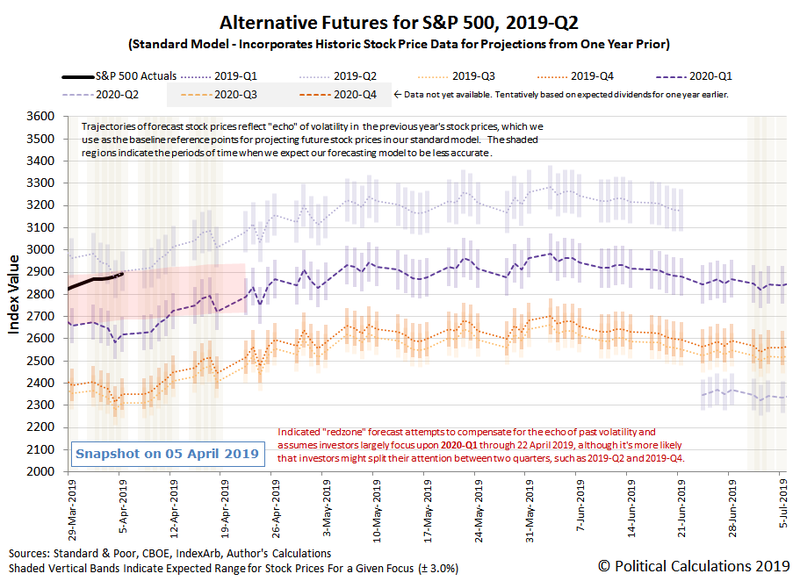 Fortunately, the echo of past volatility in stock prices is starting to fade, where we only need to continue displaying the redzone forecast for just another two weeks. 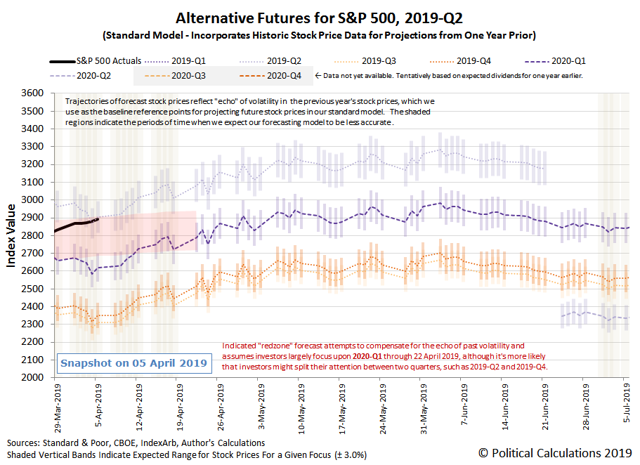 The following spaghetti forecast chart shows what our dividend futures-based model projects for the S&P 500 during 2019-Q2, where each indicated trajectory corresponds to investors looking forward to a different point of time in the future in setting their expectations. Meanwhile, the news of the past week suggests that stock prices are perhaps being speculatively bid up in anticipation of a trade deal finally being worked out between the U.S. and China. Elsewhere, Barry Ritholtz listed six positives and six negatives that were to be found in the week's markets and economy-related news.